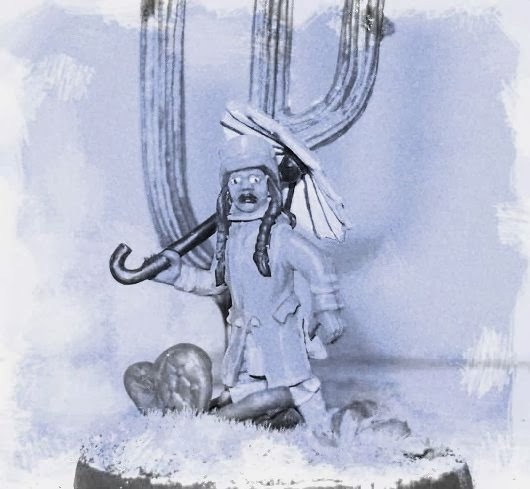 This is my third entry to the Fourth Analogue Painting Challenge, for the favorite character round: Chief Buffalo Hump, of the Comanche. Buffalo Hump is both a historical figure, and a character in the last novel of Larry McMurtree's Lonesome Dove series, Comanche Moon. He was a chief of the Penateka band of the Comanche. 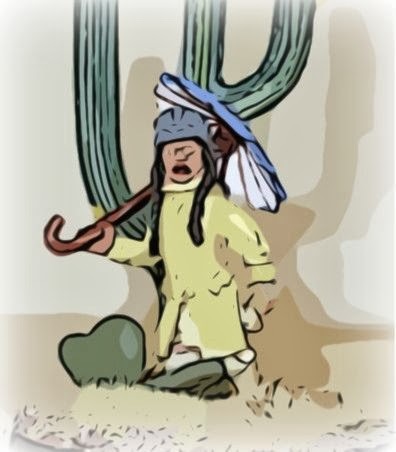 By Buffalo Hump's time, the Penateka were "a decayed and degenerate" (quoting S. C. Gwynne's Empire of the Summer Moon) version of their Comanche cousins of the Staked Plains. They lived on the frontiers of Texan society, both ravaged by and benefiting from their contact with American and Mexican Texan settlers. Cholera and smallpox ravaged their ranks, and settlement reduced their hunting grounds, while they became dependent upon settlers for their very livelihoods. Buffalo Hump's name was Po-cha-na-quar-hip; if properly translated, it meant "erection that won't go down." S. C. Gwynne puts the mistranslation down to white prudishness. Before the Council House Fight, Buffalo Hump was a minor chief, more a recruiter for war bands than an actual battlefield leader. 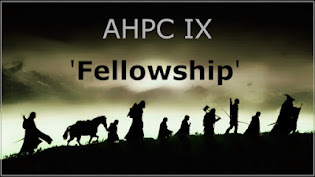 However, various disease epidemics and the Council House Fight cleared the field, so to speak, and gave him both the apocalyptic vision of driving white Texan settlers into the sea and the means to carry it out. The result was the Great Raid of 1840, where Comanche's under Buffalo Hump's leadership swept Texas from the Staked Plains to the Gulf of Mexico, rampaging, pillaging and burning. 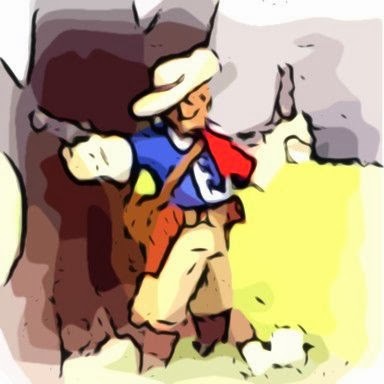 An estimated $300,000 worth of trade goods were in the port of Linville alone, and the Comanches swept up nearly 3,000 horses, and thousands of dollars worth of other loot. 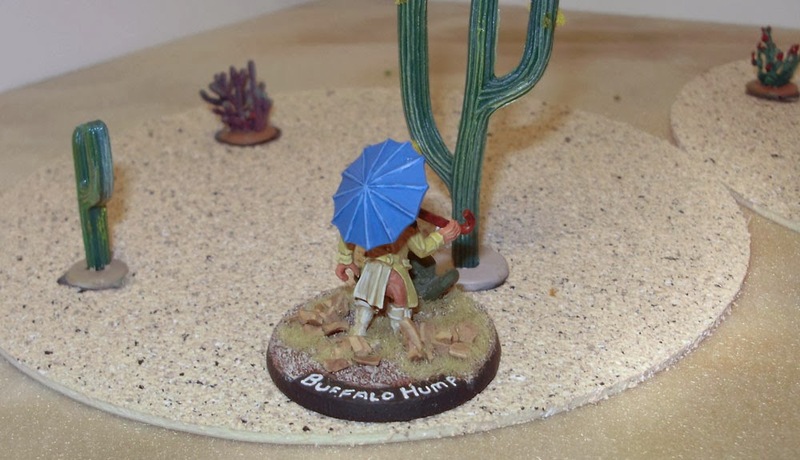 Despite his apocalyptic vision, Buffalo Hump became known as more of a peacemaker and concilliator than a die-hard last stander. Negotiations for truces and a lasting treaty went on between Buffalo Hump and other Comanche chiefs and Sam Houston in 1843 and 1844, and peace was almost there, until the Texas Senate deleted the border agreements separating Comanchería and Texas, Buffalo Hump repudiated the treaty, and the war was back on. After the Texas Annexation and the Mexican War, Buffalo Hump realized that he could not win against the might of the US. 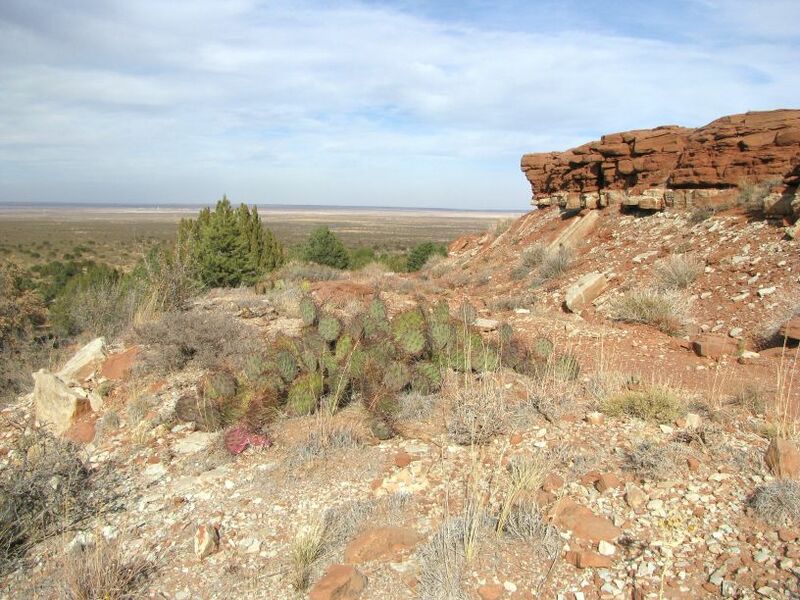 He and the Penateka settled down on the Comanche reservation on the Brazos, and made a go of it. 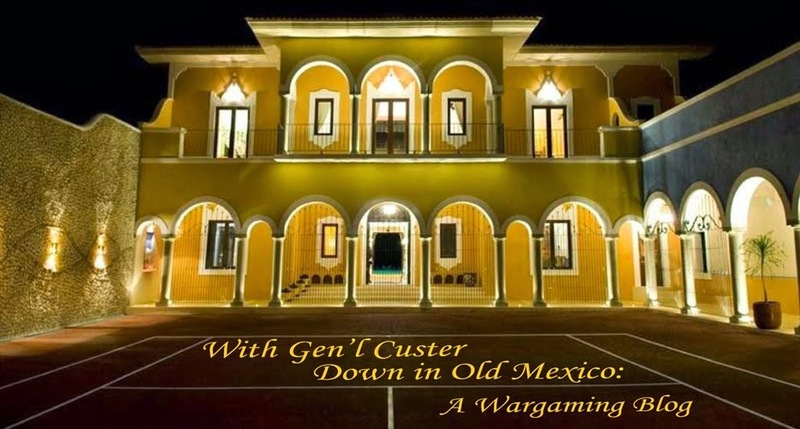 Between the Comanche being thoroughly miserable at poor conditions and a lack of food, and a plague of white horse thieves and squatters, settling there was a disaster, and the band left in 1858, pursued by troops under the future Confederate general and serial womanizer Earl van Dorn. The Penateka were resettled on the Comanche-Kiowa reservation at Fort Sill, and Buffalo Hump settled down to be a farmer until he died in 1870. The figures are from Conquest Miniatures. 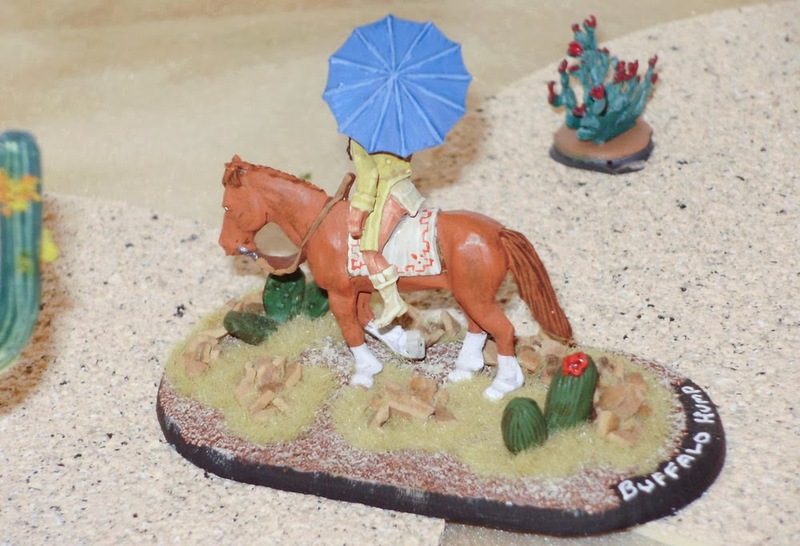 They make mounted and dismounted versions of Buffalo Hump, as well as a very nice and modular selection of Comanche. Right now, the mounted versions have to be purchased as the Comanche War Party, but dismounted versions can be bought separately. There's a lot to love about this figure. 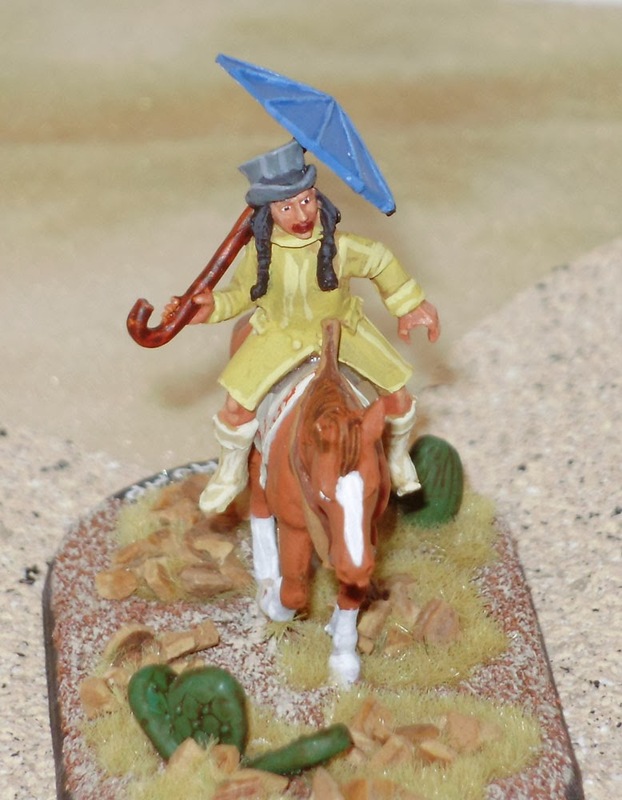 The features are slim and well detailed, and the character in the umbrella and the backwards duster makes it hard to resist painting. The detail is crisp enough to allow easy highlighting without being overdone. Unfortunately, Conquest suffers from flash problems; though not as bad as the Perry's metals, it was annoying to get off. 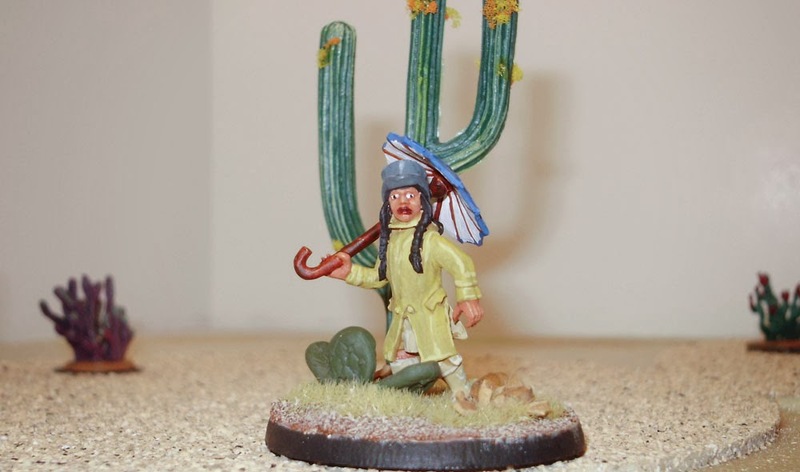 However, the backwards duster and umbrella were more than enough to get the nod for "favorite character" - it's certainly one of my favorite miniatures. For inspiration, I used the following painting of the Great Raid of 1840, even though I plan to set my Comanches in the 1860s-1880. I went with a generally muted color palette, with two different beige templates for his duster (Reaper Chestnut Gold triad), loincloth and moccasins (Reaper's Blond Hair triad, which is now my go-to for buff colors). 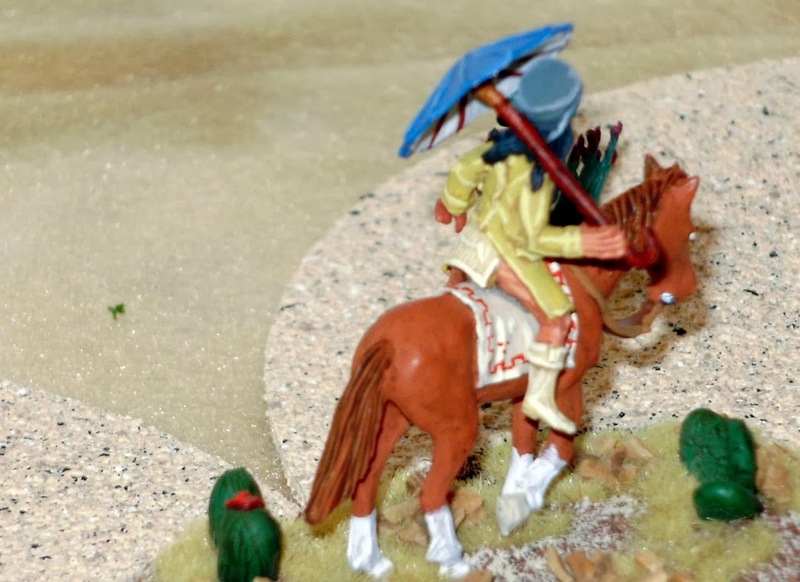 The only splashes of real color were the red pattern on the horse blanket and the blue and white umbrella. Skin was Foundry's Native American Flesh triad. I used large (40mm round and 40mmx75mm oval) bases, to make sure that the Comanche will be properly spread out on the table top, however a potential player lines them up. Stealing an idea from Curt, using a Gale Force 9, with black beveled edges, instead of my usual Litko or Warbases bases will allow leaders/characters to stand out on the tabletop. While some major filing has to be done with the GF9 bases, I think the effect is worth it. 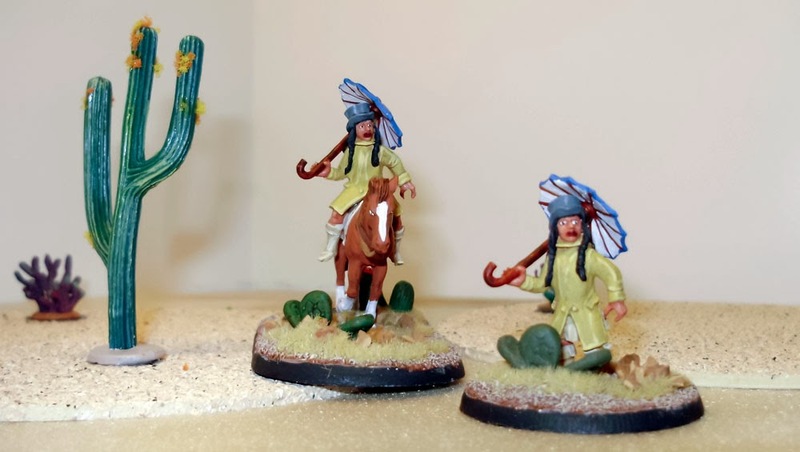 I added some Dungeon Decor cacti to the bases, painted up with Vallejo's Reflective Green dry brushed over Dark American Green, then washed with Sephia Wash. I used to use washes heavily with my 15mm figures, but switched almost entirely to three-tone shade/main/highlight style for my 25mms. I'm now working washes back in because for some colors it's the only way to get a natural look. Both figures. That's a Woodland Scenics cactus to the right; I've been working on some terrain but haven't had time to finish the basing on it. I can't say he did too well in the judging - despite repeated mentions in the entry, he only garnered one vote, but I am pleased with him. Maybe I should have submitted the cartoonized versions?